You are here: Home / Travel / Are there any Cenotes in and around Akumal? Lying close to the heart of the Riviera Maya, Akumal is located 75 miles south of Cancun along Mexico’s Caribbean Coast. The healthy coral reefs, underwater caves and placid lagoons brimming with sea life, make Akumal a very attractive destination for fans of snorkeling. On Trip Advisor forum, a poster asked about the best cenotes in and around Akumal and info on some organized tours for the same. 6. Aktun Chen – It’s on a smaller scale than the others mentioned so would not take a whole day. The price is reasonable and if you pay online their website offers 20% off. 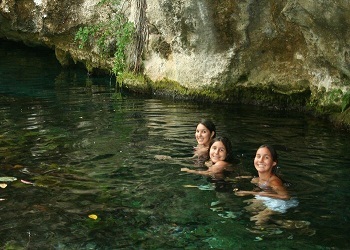 There is no need of an organized tour for most of these cenotes. You can explore at your own pace, stay for as long as you please for under ten dollars. As a first-timer, if you are looking for an organized tour, you can book one with EdventureTours. Their website is: http://www.edventuretours.com.mx. They can customize a tour for you according to your group size and interests.